In the last month of 2008, it was my delight and joy to host Bread Baking Day #15. This is a monthly event for enthusiastic bread bakers who eagerly drop in from across the world to try their hand at a themed bread baking event and share their lovely results with us all. The brain child of Zorra of 1x umrühren bitte, Bread Baking Day is guest hosted every month by one amongst an ever-growing pool of contributors to this event. As the new year 2009 begins, I pass on the baton to Temperence of High on the Hog. Do visit her blog to know the theme of BBD #16!! The theme for BBD #15 was Festive Breads keeping in mind the many festivals that grace December. I was delighted to see the enthusiasm of my many foodie friends towards this theme and was overjoyed at the response to the event. In total, I received over 30 entries. To do justice to each entry, I have decided to do this round-up in two parts. Part 2 follows shortly. Kindly note that the entries are organised in the order that I received them. Before I proceed I would like to say a big thank you to each and everyone who participated :) December is a busy month and I appreciate your contribution!! 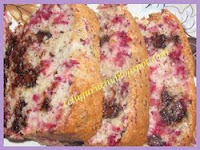 Uma of Essence of Andhra set the entries rolling by baking a colourful Cranberry Bread with Pureed Fruit. Though skeptical about cranberries in the beginning, she combined them with some semi-sweet chocolate chips to get a fragrant loaf. Uma also used a mashed banana in place of eggs for this recipe and was astounded at the beautiful result. Sweatha of Tasty Curry Leaf sent in two beautiful entries. The first - Clover Leaf Rolls are attractive dinner or breakfast rolls that are prepared on special festival days. The shape of the cloverleaf is believed to represent the Holy Trinity. Though they are traditionally made with Brioche dough, Sweatha used tofu and soy milk as egg substitutes for these pretty rolls. Festive Julekage is Sweatha's next entry for BBD #15! A Scandinavian Christmas Bread that is popular in Denmark and Norway, Julekage is essentially a spiced sweet bread filled with nuts and candied fruits. Sweatha tried this bread with and without a sugar icing and loved it in both versions! Lien a busy mum of two young kids still finds the time to bake an Italian Christmas bread annually to share with her Italian class. This year, she decided to go with the Pandoro, a beautiful golden toned bread that comes from the city of Verona. Baking it at the very last minute ensured that the bread was still warm when Lien cut it for her class. Needless to say there was applause and the bread was a big hit. You can find Lien's recipe at her blog Notitie van Lien. Zorra of 1x umruehren bitte aka kochtopf baked a Christstollen this holiday. The recipe comes from Backer Supke, a German baker whose blog she follows. Having successfully attempted a couple of his recipes, Zorra was encouraged to try the Stollen recipe this Christmas. Chock-full of rum-soaked raisins, candied fruits, and flaked almonds, this recipe yields a beautiful sweet festive bread that tastes best after a week!! Don't think I could wait that long!! Soma and her family have always celebrated the holidays and the spirit of sharing. Every year they decorate a beautiful tree, get ready for Santa Claus, and Soma bakes some festive goodies. 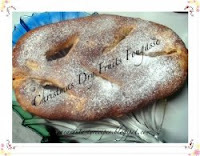 This holiday Soma baked a traditional anise flavoured Greek Christmas Bread or Christopsomo . 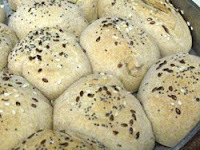 Read more about the religious significance of this bread and the tasty outcome of Soma's endeavours at ECurry. Boaz from Grain Power tasted Stollen once at a San Diego local farmer's market. Since then, he has had this festive bread on his 'to bake' list. 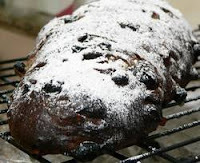 He followed Andrew Whitely's recipe for Stollen from Bread Matters as the recipe allows for whole wheat flour. Boaz filled his bread with dried fruits and home made marzipan and dusted it with some powdered sugar for a stunning result. Elle from Feeding My Enthusiasms says that potluck dinners are a part and parcel of the holidays. And what better way to pitch in than to prepare healthy, warm, and yeasty dinner rolls. Oats Whole Wheat and Barley Rolls are just perfect for any such occasion. Following a recipe from Marion Cunningham's The Fannie Farmer Baking Book, Elle found that you can easily prepare between 24-30 pull apart dinner rolls in under 15 minutes! Mary prepared the favourite Dresdener Stollen this Christmas. Mary does true justice to this beautiful bread which is studded with raisins, almonds, and peel, and filled with a sweet almond paste. Visit One Perfect Bite for the touching story behind this bread. Aparna tells us about the origin of the Kugelhopf - the favourite festive bread of Europe on her blog My Diverse Kitchen. She baked her Kugelhopf in a bundt pan and glazed it with a delicious orange glaze! Just look at the wonderful colour of the bread!! 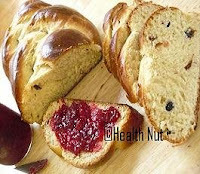 A Braided Fruit Challah is the bread of choice for Yasmeen at Health Nut. She served it with home made Cranberry Preserve. What a very festive combination!! And in the spirit of giving this festival season, Yasmeen brings to notice the work of Blogger Aid to raise money for the World Food Programme. More of the seasonal cranberries but this time with crunchy pine nuts and fennel! Susan of Wild Yeast served a Cranberry Semolina Crown with Pine Nuts and Fennel for Christmas dinner. If you love baguettes, you will love this crusty bread, says Susan. You can also save this bread for later as it tastes wonderful toasted with coffee or a smear of goat's cheese. All text and photographs in this blog, unless otherwise noted, are Copyright of © Annarasa 2007-2012. All Rights Reserved. Kindly do not reproduce without permission. Thanks and waiting for the second part.You summed up everything nicely.Very happy to be a part of it. You've done a great job with the theme and hosting. Thanks. Saw it all Apu! Its an awesoem collection. Saving it, mostly when I make the rich breads in the holidays. thanks for a wonderful round-up! So happy to be part of it! Many delicious bread recipes to try. Such a wonderful array of festivity! Thanks for hosting this great theme this month. The breads look good! Thanks for a beautiful roundup, Annarasa! Happy New Year!